So, Kara, while you were in hibernation I started this weekly Crush of the Week feature to pay tribute to unsung heroes of ’90s awesomeness. Today, I would like to thank all those fine people who hung out at the NYC Rocky Horror in the early nineties for not taking advantage of me or my friends even though we were fifteen, drunk on wine coolers and hanging around super late all the time. It was very 90s-womanish of you to be so non-date-rapey. That is all. 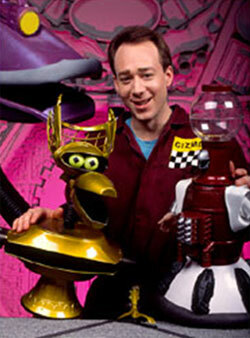 The kids I babysat for in the ’90s used to tease me about my crush on MST3K‘s Joel Hodgson. We watched the show a lot together and they’d say, “You’re going to maaaaaary him.” While I did date many witty potheads in tribute, I did not marry or ever meet Joel himself. He seemed super fun, though. I just learned he also did pretty sophisticated stand-up pseudo-prop-comedy in the ’80s before creating the cult hit, which ran from 1988 to 1999. (Here he is in 2008, disappointingly sans-jumpsuit.) Anyway, MST3K is one of those things from the ’90s that I think was meant for dudes but that actually women got a lot out of. Like jumpsuits. What’s Sexual Harassment and What’s Good Times?